The Fed intends by the end of June 2012 to purchase $400 billion of Treasury securities with remaining maturities between six years and 30 years and to sell bonds maturing in three years or less. Watch this analysis from CNBC. Long term interest rate moved sharply after the news: 30-year Treasurys now is below 3%, lower than the market panic period after Lehman’s collapse. 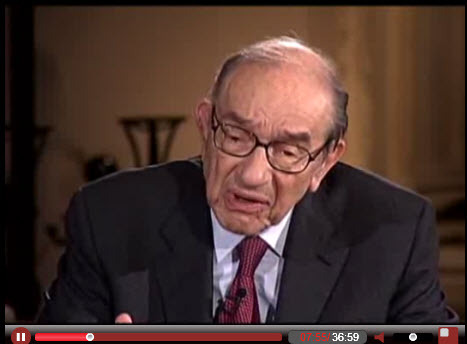 Charlie Rose interviews former Fed Chairman Greenspan. He talks about the almost certainty of a Greek default, why US economic recovery has been so weak, prospect for inflation, among other things. Despite that his reputation was severely tarnished in the past few years, Greenspan offered some really good insights of the current state of the economy. Comments on Bernanke from some big market players – take note of Bill Gross’ view on inflation expectations. In the following video, Ben Bernanke answers questions from Paul Ryan (R-WI). Paul asked some really sensible questions. Bernanke remains largely too confident. This is generally not a good sign. Allan Meltzer, a historian specialized in the Federal Reserve system, in the following WSJ piece, shares his historical view on the Fed and inflation outlook. He thinks Bernanke Fed will put us on another “70s show”. In the 1970s, despite rising inflation, members of the Federal Reserve’s policy committee repeatedly chose to lower interest rates to reduce unemployment. Their Phillips Curve models, which charted an inverse relationship between unemployment and inflation, told them that inflation could wait and be addressed at a more opportune time. They were flummoxed when inflation and unemployment rose together throughout the decade. In 1979, shortly after becoming Fed chairman, Paul Volcker told a Sunday talk-show audience that reducing inflation was the best way to reduce unemployment. He abandoned the faulty Phillips Curve thinking that unemployment was the enemy of inflation. And he told the Fed’s staff that while he thought highly of their work, he did not find their inflation forecasts useful. Instead of focusing on near-term output and employment, he changed the Fed’s policy to put more emphasis on the longer-term reduction of inflation. That required a persistent policy that President Reagan supported even in the severe 1982 recession. We know the result: Inflation came down and stayed down. The Volcker disinflation ushered in two decades of low inflation and relatively steady growth, punctuated by a few short, mild recessions. And as Mr. Volcker predicted, the unemployment rate fell after the inflation rate fell. The dollar strengthened. That was not unprecedented. The Phillips Curve often fails to forecast correctly. Spanish inflation has increased in the last year while the unemployment rate rose above 20%. Britain also has rising inflation and rising unemployment. Brazil lowered inflation and unemployment together. There are many other examples if only the Fed would look at them. Throughout its modern history, the Fed has made several of the same policy mistakes repeatedly. Two are prominent now. It concentrates on near-term events over which it has little influence, and neglects the longer-term consequences of its operations. And it interprets its dual mandate as requiring it to direct all of its efforts to reducing unemployment when the unemployment rate rises. It does not have a credible long-term plan to reduce both current unemployment and future inflation, so it works on one at a time. This is an inefficient way to achieve a dual mandate. It failed totally during the Great Inflation of the 1970s. I believe it will fail again this time. Commodity and some materials prices have increased dramatically in the past year. Countries everywhere face higher inflation. Despite the many problems in the euro area, the dollar has depreciated against the euro, a weak currency with many problems, suggesting that holders expect additional dollar weakness. Imports will cost more. I believe it is foolhardy to expect businesses to absorb all the cost increases by holding prices unchanged. And loan demand has started to pick up, increasing the amount of money in circulation. It is a big mistake to expect that the U.S. will escape the inflation that is now rising throughout the world. Because the Fed focuses on the near term, it tends to ignore changes in money-supply growth. This, too, is a mistake. Sustained inflation always follows increases in money-supply growth. Sustaining negative real interest rates (i.e., adjusted for inflation), as we have now, will cause this. The Fed should make three changes. First, it should increase the short-term interest rate it controls to 1%, which would show that it is aware of the inflation risk and will act promptly to counteract it. Current low interest rates are an opportunity for the Fed to start reducing excess reserves. First interview with Boston Fed President Eric Rosengren. His main message I took away is, “with nominal interest rate fixed (near zero level), disinflation would be monetary tightening. Deflation would be even worse”. This offers enough reason for further monetary easing. Also, one lesson learned from Japan was that monetary policy under “liquidity trap” should be proactive. The Fed’s monetary easing can’t afford to be nearly as gradual as Japan. Second interview with John Taylor. According to Taylor Rule, current interest rate should be at .75%. He is not in favor of QE2. The last interview with Jim Hamilton on how the Fed might affect long term interest rate through bond purchase.